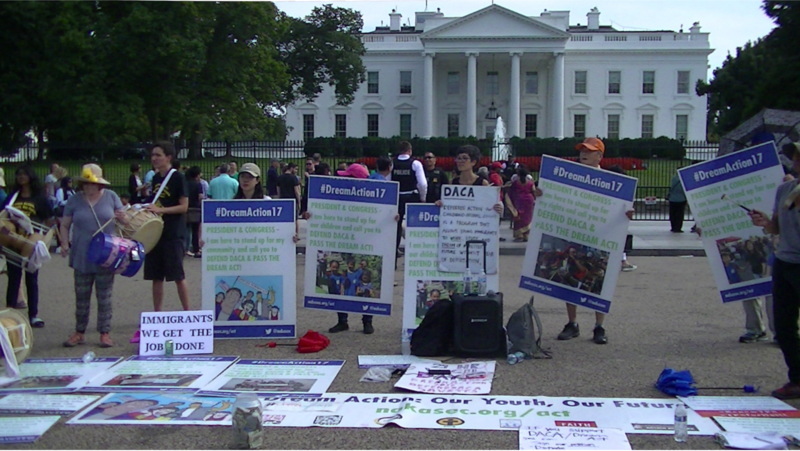 The National Korean American Service & Education Consortium(NAKASEC) is holding a continuous vigil for DACA known as #Dreamaction17 until September 5. Sep 5 is the deadline given to Trump by ten racist state attorney generals to kill off the DACA program or face lawsuits. Read more about The Shortwave Report 09/01/17 Listen Globally! 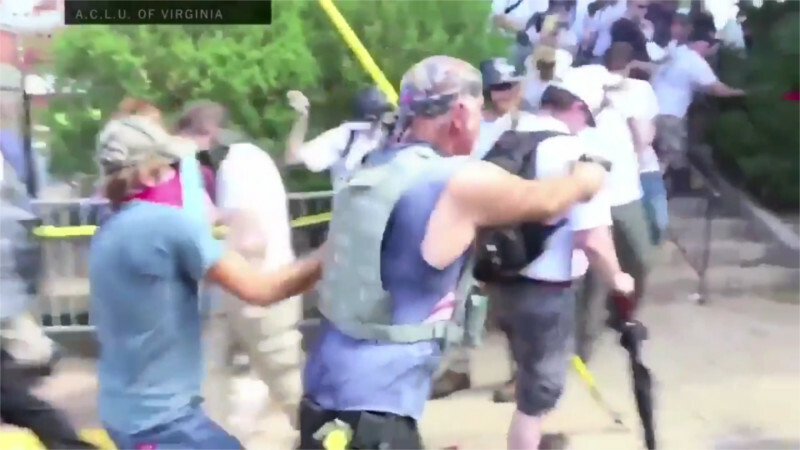 Still from ACLU VA video showing Nazi firing pistol at an African-American counterprotester in Charlottesville. 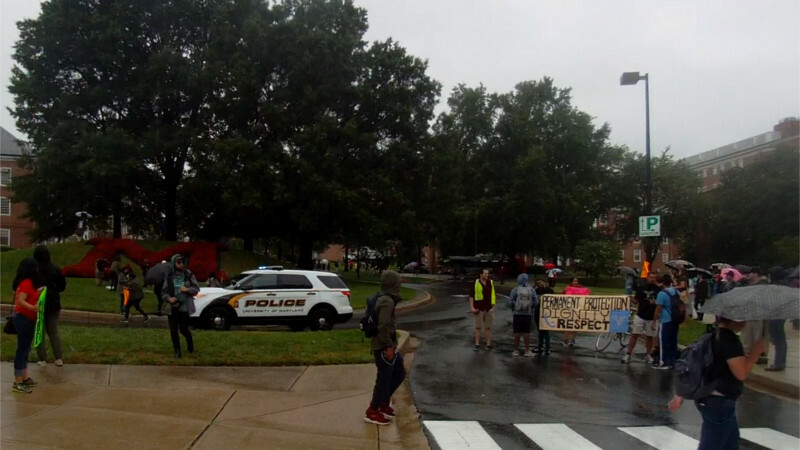 On the 29th of August, immigrant youth staged a skit simulating an ICE raid on a family in the center circle of University of MD's campus roads. Supporters including area antifascists blockaded the roads around the circle. The protest held the streets and circle for 11 minutes, symbolising 11 million people at risk for deportation under the Donald Trump regime. August 28 was the 54th anniversary of Martin Luther King Jr's famous March on Washington. 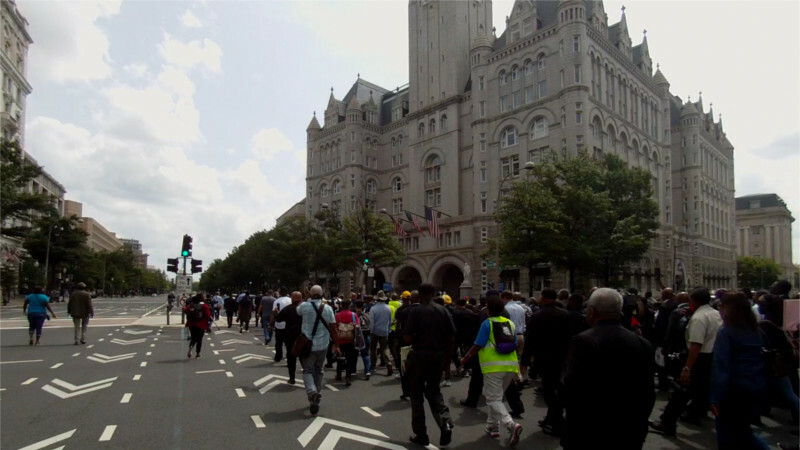 It was hoped that 1,000 ministers would show up for the 1000 Ministers March for Justice on this day-but over 3,000 registered and a huge crowd marched from the MLK Memorial past Trump Hotel to the Dept of Justice. 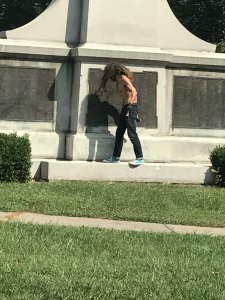 On the 27th of August, a major anti-Fascist mobilization in Berkeley, CA succeeded in stopping a planned "America First" alt-right/Nazi rally by occupying the intended site of the racist event. 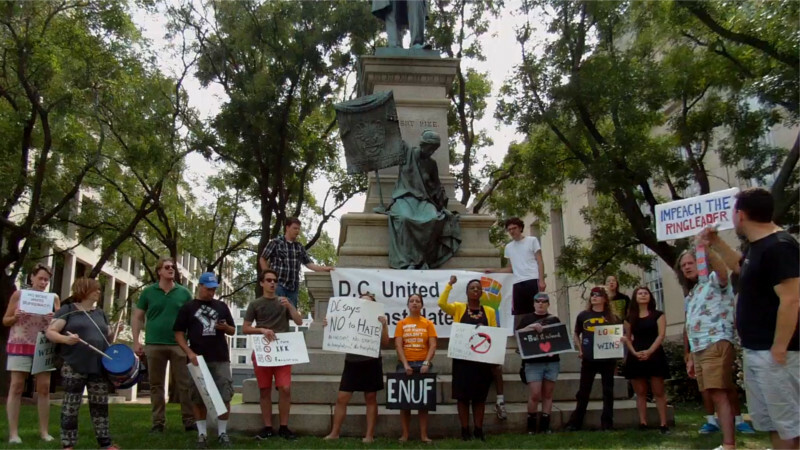 DC activists responding to a national call for solidarity protests held a speak-out at the Albert Pike (Confederate/KKK) next to MPD headquarters. 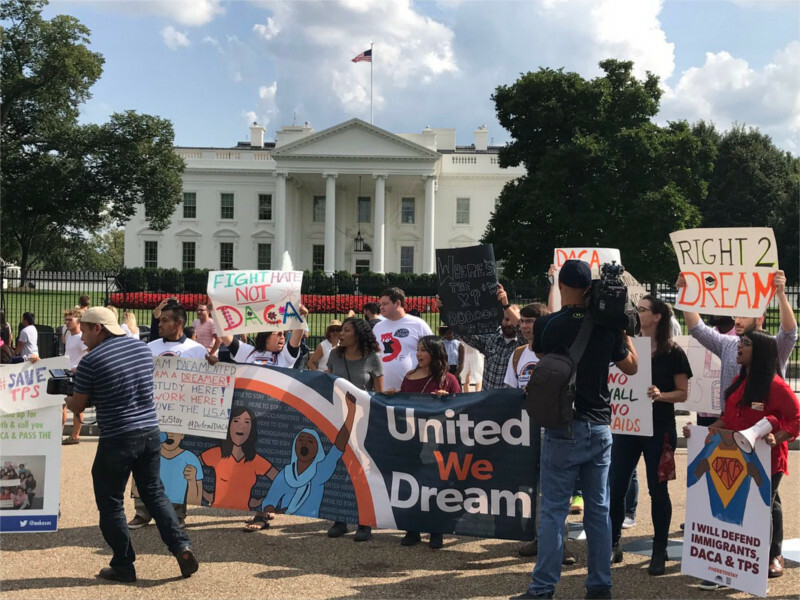 On the 25th of August, migrant rights advocates showed up in front of the White House demanding that Trump not unilaterally end the DACA (Deferred Action on Childhood Arrivals) program. About 800, 000 young people have been protected from deportation by this program, which shields from deportation may who were brought here as children. Read more about The Shortwave Report 08/25/17 Listen Globally! "Good Night Alt-Right" video originally posted to Youtube by Rabashov with special thanks to sub.media showing white supremacists getting their asses kicked from Phoenix, AZ to Charlottesville, VA, to Wash DC and many other places. Also WWII and Holocaust clips included, reminding everyone that we've stopped fascism before-and WHY we had to get so violent in the 1940's to do it. On the 23rd of August, the Dept of "Injustice" had to abandon their attempt to obtain IP address logs of all 1.3 million visitors to DisruptJ20.org from Dreamhost due to resistance by Dreamhost's lawyers. The next day, as the court heard the case, Dreamhost received a powerful DNS attack that made many of their sites unreachable. On Sunday, the 20th of August, workers at the Takoma Park Silver Spring Co-op also known as the Takoma Park food co-op voted to unionize with the DC Chapter of the Industrial Workers of the World (IWW).